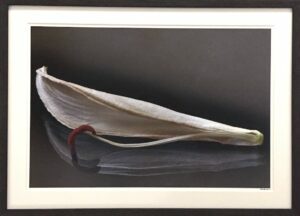 Dried lily with stamen on glass a 21 x 29″ wood-framed work on paper from the Life and Afterlife series was juried into 311 Gallery’s Flowers and Gardens, a national show. The jurors were artists, Jim Hallenbeck, Linda K. Eddins, and Susan K. Jones. Life and AfterLife is a much awarded series. A year in the making and released in 2006, it is my first fine art series as a professional artist. Natural attrition is depicted. Petals were shed some complete with stamens. The piece, Dried lily with stamen on glass evokes images of Imogen. Flowers and Gardens is on show at 311 Gallery, 311 West Martin Street, Raleigh NC. From Thursday July 5 through Saturday July 28, 2018. Opening Reception, is on Friday July 6, 2018 from 6 to 9 pm. Shown below is a snapshot of the wood-framed, museum glass glazed artwork printed by me on archival paper. To view this piece and the Life and AfterLife series on my Art page, click here. For gallery hours and directions, please google 311 Gallery.